Donald J. Trump continued an inaugural tradition after he was sworn in as the 45th president of the United States. With his wife, Melania Trump, at his side, he stepped out of their limousine and took a brief stroll along Pennsylvania Avenue on Friday to wave at crowds during the inaugural parade. The walk has been an informal custom since 1977, when President Jimmy Carter became the first to set out by foot for more than a mile on the route to the White House. “Once somebody does something innovative, it becomes a tradition,” Doris Kearns Goodwin, a presidential historian, said during a telephone interview. “There is a desire to show that they are a people’s president, and in that moment of a ceremony, when so many people are gathered to watch, they want the people to feel they are going to be part of it.” The decision whether to walk during the parade is apparently left to the new president, presumably with input from the Secret Service and other advisers. Donald J. Trump continued an inaugural tradition after he was sworn in as the 45th president of the United States. With his wife, Melania Trump, at his side, he stepped out of their limousine and took a brief stroll along Pennsylvania Avenue on Friday to wave at crowds during the inaugural parade. The walk has been an informal custom since 1977, when President Jimmy Carter became the first to set out by foot for more than a mile on the route to the White House. Mr. Carter’s walk with his wife, Rosalynn, and 9-year-old daughter, Amy, became a tradition that has been matched in ceremony if not in length by the presidents who followed. 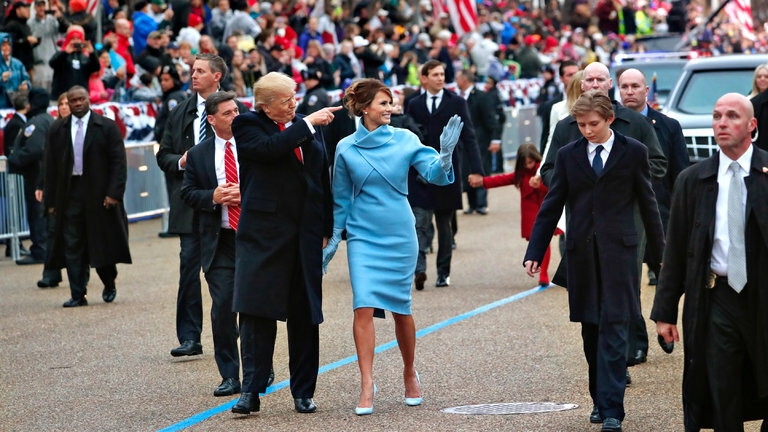 The decision whether to walk during the parade is apparently left to the new president, presumably with input from the Secret Service and other advisers, Ms. Goodwin noted. The walk’s duration is also largely dictated by weather, security concerns and the politics of the time. Earlier, as Mr. Trump dined with dignitaries and members of Congress in the Capitol, the riot police clashed with protesters, hurling flash-bang grenades to drive them from streets near the parade route. Other members of Mr. Trump’s family got out of their vehicles in the motorcade, which paused briefly as Secret Service agents stood guard. That walk lasted about three minutes, with the Trumps returning to their vehicles. The family then walked another stretch of the road around 4:40 p.m., and later arrived at the parade viewing stand near the White House. Here is a look at how previous presidents traveled the route, drawn from The New York Times’s archives.